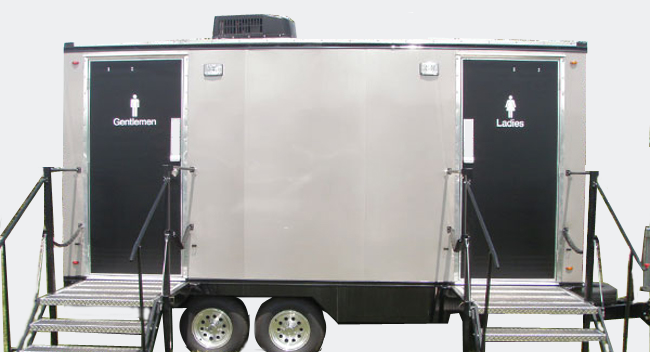 Avail Mobile Restroom Trailer for rent at Porta Potty Direct to keep you guests at finest comfort and convenience when they turn up at your event. Be it a small event or a ludicrously big one, Porta Potty Direct doesn’t fail you when it comes to sanitary needs. When it comes to mobile restroom, Porta Potty Direct offers the best – in – class mobile restroom trailers to cater to any event of any size. The water holding capacity of both fresh water and discharged is in abundance and the tanks are portable too! Pricing is not at all a concern with Porta Potty Direct as they are very much affordable. Available across all the states of United States, Porta Potty Direct has earned a rare reputation for its versatility in providing mobile potty & sanitary services on rent.